Donnybrook — ever take part in one? Posted on October 26, 2011 | Comments Off on Donnybrook — ever take part in one? Donnybrook (Domhnach Broc–meaning The Church of Saint Broc) is located in Dublin, Ireland. Many consider the area to be one of Dublin’s most affluent suburbs today. Donnybrook was the location for the Donnybrook Fair. This event was notorious for drunkenness and violent disorder. The fair was banned in 1855. 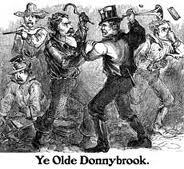 So, today the word donnybrook is applied to a quarrel fight or disturbance usually involving disorderly and violent behavior. Battle of Donnybrook. In this fight, the Scots repelled the British. Comments Off on Donnybrook — ever take part in one? This word is not the same as briefing. In many instances, such briefings and debriefings are of military or law enforcement nature. pilots usually do a debriefing after the complete a mission. full shift, there was a brief debriefing for all involved too. Mondegreens were the subject of my last blog post. 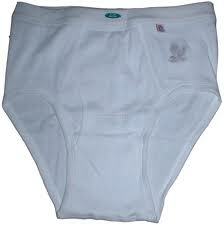 It seemed to be popular, so I dug up some items from Saturday Night Live. Why SNL? 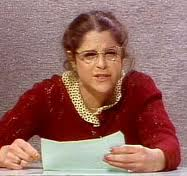 Well I think Emily Litella (played by Gilda Radner) were some excellent examples of mondegreens. As a reminder–A mondegreen is defined as the mishearing or misinterpretation of a phrase in a way that gives it and new meaning. The mishearing is usually not very plausible. SNL was great at this. Radner would go into a tirade on about some topic. Eventually, the newsperson would interrupt her to point out her error.